Home > Article > Skateworld of Kettering Sign up for their summer camp today! Skateworld of Kettering is quite the hidden gem in Dayton! Offering a huge range of activities for your family to enjoy. 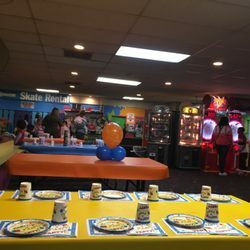 Skateworld of Kettering has been providing the Miami Valley with a family-friendly environment for all ages. This summer, Skateworld of Kettering will be holding multiple weeks of summer camps! Weekly camps will be held June 11th-15th, July 9th-13th, July 30th-Aug 3rd. Camps will include, Roller Skating, Miniature Golf, science experiments, games, arts, softplay and friends come together to create a fun and interactive week of Fun! On March 31st (weather permitting), The Trials Miniature Golf Course will open! Bring an Easter basket for an Easter Egg scramble! The Trails Miniature Golf boasts two gorgeous 18 hole courses with NEW GREENS surrounded by trees and a natural stream creating one of the best miniature golf experiences in Dayton. Open from April through October, weather permitting, The Trails Miniature Golf is the one location for all ages, corporate events, Summer birthday parties, group outings and more. For more information just click below! The softplay playground is available during public skate sessions and private parties for an additional fee! Stay up to date on their busy calendar with events all year long!